Evening all 🙂 Sweet win here for the GOAT as he continued his bid to win a 7th Cincinnati title seeing off Andrew Barron Murray 6-4, 7-6(6). Tonight's encounter was far from Peak Fed but the Swiss won the big points when he needed them to record victory in 1 hour and 37 minutes. The win means he's now won the last 5 meetings against Murray, the last 10 sets and has faced just 1 break in his last 38 service games against the Scot. Impressive numbers. And should Roger win tomorrow's showpiece he'll also return back to Number 2 in the World Rankings ahead of the US Open. Murray won the toss and elected to serve. Roger immediately posing a question, holding 2 break points before Murray dug in to start with an important hold. At 1-1 the Swiss created his third break point of the set, hitting a sweet forehand + drive volley combo at 30 all before breaking to lead 2-1. Murray had a slight window to hit back at 0-30 but Roger won 4 points in a row to hold. The one break proved the difference and Fed sealed the set 6-4 with a big inside in forehand that clipped the line. Into Set 2 and Murray began to make things more competitive, holding to love in the opening service game hitting some timely big first serves. Despite looking comfortable Murray's big problem was he was unable to a foothold any of his return games despite Federer only making 55% of first serves. In game 6 the Swiss was again the one holding a break point, but Murray held firm and both players rode out the next 5 service games with little drama to force a tie break. With Federer holding a 7-2 advantage over Murray in tie breaks it was advantage Switzerland and he moved up an early mini break to lead 3-1. At 4-2 Murray got back on serve hitting a well struck return from out wide on the deuce court. At 4-5 Fed serving the GOAT then had to come up with some stupidly good forehands to stay level, skipping round what could have been a backhand to drill a winner up the line. Just immense footwork and I think that point won him the breaker. 5-5 then became 6-5 Federer giving him match point only for Murray to save it with a big serve. On his next serve though Roger came up with a sliced short return + lob + half volley winner to setup his 2nd match point which he took in style with a huge inside out forehand which gave him a volley put away to seal the deal 8-6 in the breaker. The old adage you're only as good as your second serve held true for this one as Federer won 23/29 (79%) of points behind his and that proved the difference between the two. Murray actually held up well considering his marathon matches against Dimitrov and Gasquet but he couldn't get any footholds in the return games to really make an impact. Roger wasn't having his best returning day either to be honest but he just kept Murray at arms length throughout, fending off a mini Murray fightback in set 2 where he built some momentum and winning the big points with some line finding groundstrokes and clutch serving. All in all it was another committed and solid display from the Swiss to get the job done without any real fuss and he's now on a 5 match winning streak against Murray stemming back to the 2014 Australian Open. Next up is Djokovic who again had to dig deep to defeat Dolgopolov in three sets in an up and down match. You gotta admire Djokovic's resilience in these types of matches where losing would be the easy option; he always seems to find a way through. Dolgo should really have seen him off though as at 5-4 in the 2nd set tie break he backed off coming in behind a decent serve only to get caught in no man's land and dumped a slice into the net. It would have been an easy put away volley but yet again Djoker made him play and eventually made him pay. Obviously the last match between these two was the Wimbledon final which wasn't the preferred outcome for Fed fans, or 99% of those watching to be fair, so it would be a good day if Fed could win his seventh Cincinnati final. Based on court time alone you have to like his chances as Djokovic looks slightly weary after Montreal and a string of three setters in Ohio but it is a final so anything can happen. We've seen Djokovic look dead and buried before only to raise his level when it really counts and there's plenty to suggest he might do the exact same tomorrow to complete his set of Masters 1000 titles. 5 wins a row against Murray, not bad to say he lost 6 out the first 8 meetings. Another solid display on the 2nd serve especially. Omg! Retiring immediately! At the top!! Haha Sus1e taking down the title. Djokovic will have to be a lot better than he was today – though Fed will probably have to be better than he was today also. Will need to serve better v Novak. Andy doesn’t hit as deep as Novak so Fed must stay on front foot, and not get pushed back. I think everytime Fed has won against Novak, 2nd serve % has been above 64. Yeah I remember Koenig coming up with a stat like if he wins 55% of 2nd serves he wins ninety-odd percent of the time. Hope he can defend it well tomorrow. Fast conditions should help. Hi Jonathan, Thank You for your great analysis on today’s Semi-Final match Federer/Murray. Delighted Roger won, it was a bit shaky at times that had me nervous…..but he came through with a win. Pray Roger will win his 7th title in tomorrow’s Final. Djoko’s game is a hard nut to crack. Make it Klasse, Roger! And yeah there were a few brief moments in the second set where Murray looked like he was getting himself into the match. Glad Fed kept himself in front and got it done in 2. I’m confident Fed will win his 7th Cincy. He has been better than Djokovic in pretty much everything this week and Djokovic has been average. I don’t see Djokovic rising to his best tomorrow even I’m sure he is committed to completing a golden masters. Fed was better than Djoker all Wimbledon and look what happened. It’s all very much about on the day. Djoker might have looked average but he’s in the final for a reason. I think it will be close. 60/40 Djoker. Djoker is the heavy favourite going into this meeting. Roger will need to serve near perfect and not allow him to get into a defensive position. Feels like it’s been a century since Murray broke the Federer serve- and long may it continue! Hard to deny that Andy was feeling the effects of the last two weeks but the fact that Rog managed to hold him off in the second serve was impressive. Could be just my observation but it seems the BH to BH tactic Murray employs isn’t as effective anymore as it once was? 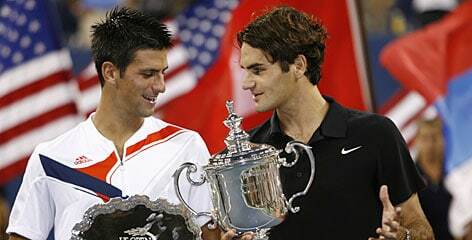 Never thought Fed would solidify his place in this rivalry after that 2013 Australian Open semi. Who else is enjoying Fed rushing the service line on the return? Whatever works for you old man! How Novak escaped to the final makes my head hurt, the guy just doesn’t back down. Fed will be hugely frustrated you would think if he couldn’t get a win over him this season but we’ve all seen the world #1 play scrappy tournaments and end up being unbeatable in the final. So much on the line here for him to claim the golden masters and go up in the H2H for the first time. Beating Djoker doesn’t change Roger’s chances in New York but would be a sweet victory nonetheless. Allez! He didn’t look fatigued though, ran down pretty much everything. Rallies were pretty short too – 2,3,4 shots so never got physical. Fed just seems to have his number of late. If Roger could some how when this tournament for the 7th time again without dropping serve or sets will be a greater accomplishment when he did it in 2012 because the situation is different and there is more on the line. – Djokovic’s defending and athleticism won’t be rewarded well in a faster surface like Cincinnati compared to their Indian Wells, Rome, and Wimbledon this year. – Djokovic hasn’t been playing very this tournament and even in Montreal I would say he didn’t look too good. Looks very lethargic, and slow at times and Federer won’t let a choke like Goffin, Dolgopolov happen. Djokovic seems to be able to defend well on all surfaces regardless. I think the speed of the court just allows Fed to be able to hit that bit more through the court and open it up. Djoker will still be coming up with mega stretchy slides to dig up balls. I agree he should be out of the tournament, Gulbis should have done the same in Montreal, but he still played a pretty good final and only just fell short. Fed will need to be close to his best tonight. Dare we hope that he’s saved the best for last? I see you’ve already alluded to this, Jonathan, in your last paragraph – at Wimbledon, it really seemed like he just peaked one match too soon. Now – well, you’ve all said it. 1st serve has to be better – hopefully today’s practice in daytime conditions will prove helpful there. Novak OUGHT to be worn out, but frankly Andy should have been too, & I was really impressed at how he (mostly) kept chasing down balls out there. Cooler, less humid conditions probably helped a lot there. Fed shouldn’t be perturbed by any MTO antics, if they should occur, tomorrow; he knows that’s part of the guy’s MO. Novak will almost certainly continue to do impressions of Gumby, and his mental fortitude is titanic. I guess I expect both guys to want it – but I expected that at Wimby too, and after set 2 it seemed like Roger wasn’t fighting with the kind of desire I expected. I don’t expect him to be able to bring his absolute best every time; but I do expect him to try. Hope his head is in the right place tomorrow. LOVE the close-in returns – Fed kind of said this in the presser, but it’s like it gives him another option to use to vary the pace. Don’t do it every time, be smart about it, but don’t shy away from it either. Those last two points of today’s match were phenomenal, weren’t they? He has beaten Djokovic this season, in Dubai; but as you say, I’m sure he’d like to get a bigger title over him. As he also said in his presser, I’m not sure how important the #2 ranking is for USO – it might actually be better for him to meet Novak earlier than the final, & I’m sure I’ve heard some rumblings here to that effect. Of course the draw might not turn out that way even if he isn’t ranked #2. But let’s not get ahead of ourselves. Here’s to some luminous tennis from our Roger tomorrow. Komm jetzt! Oh right, had forgotten about Dubai! Thinking of masters and slams then. The ranking doesn’t really matter like Roger has said multiple times . Regardless if he’s #2 or #3, Novak will be the favourite in the final or semis. The last few years, Fed has had problems with outsiders (Berdych, Robredo, Monfils, Cilic) in NYC so can’t say what impact the rankings have until the draw and the tournament play out. 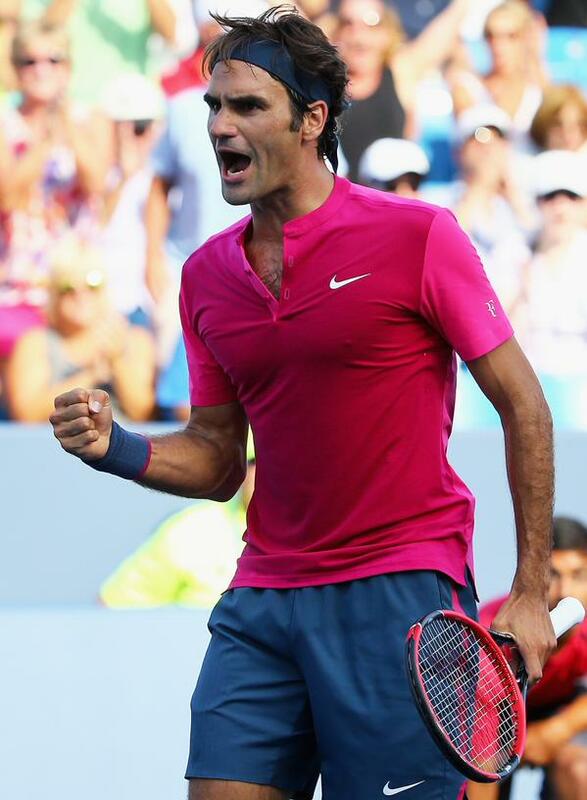 If Fed is to win USO, his game has to be on point for 7 matches so that the opponent becomes irrelevant to an extent. @Thinker – hard to say about leaving best till last. Hope so. But I guess if he’d won Wimbledon we’d all say he peaked at the right time 😆 so just hindsight as usual. @Gaurav – day session definitely faster, so should favour Fed. Hopefully warm too so Djoker gets drained. I’ll be glad either way. 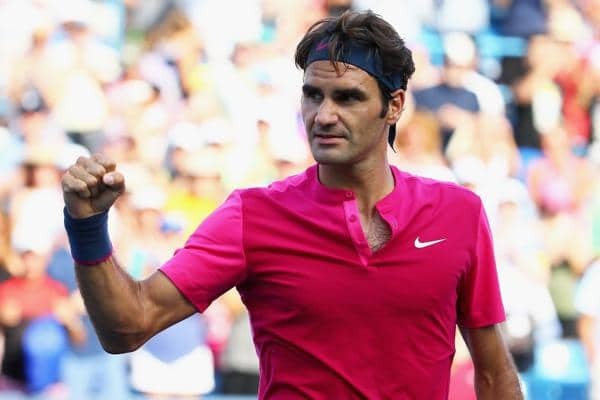 If he loses I like the #3 ranking going into NY because it gives Fed at least as fair a chance as any to face Novak at the semis of the US Open – which is the only way I see Fed beating the most consistent player in the world right now. If he’s got any chance at 18 right now, odds are better than not he has to face Djokovik…and he needs to come into that meeting with fresher legs than he usually does as a 2 seed on the tour in the age of Nole. Yes it’s a long way off. Yes it’s very possible neither even get there. But lets consider the most likely scenario of any: Look at the last few years of GS finals and typically one guy is almost always lock to be there…and his name isn’t Fed. If Fed gets the title tomorrow, he’s the #2 seed and has no chance to get to Novak before 6 best of 5 set matches have whipped his 34 year old legs. But I think what Fed has shown this year – and this summer – proves he has a real shot at landing in the finals of the USO. In my opinion – I really haven’t seen this consistent and often shocking a level (e.g., murray at SW19, HIS GOAT matches even this week) at this time of year since 2012. Even compared to last year – I really don’t see the same Fed who barely survived Monfils only to get thrashed by Cillic.. I think Fed is red hot right now and there is only one guy who can really shut that down thoroughly and consistently – the Serb. And one more “Yes”… Yes – Fed could be #3 and still get drawn in Murray’s half. But we all know Fed needs draw-help..,and I like 50% chance on the draw better than 0%. So …my little dream is a fresher legged Fed facing Novak in NY if at all possible. Cinci would be great, I’m rooting for a fast-court-exploitin-hard-attacking-Nole-thrashing by Rog tomorrow …but no matter what the Master level tourney, GS #18 would be remembered way way way more. Obviously by everyone including Fed himself. So even if he loses – I’ll be glad about not shutting the door too early on a possible USO semifinal Djokofed. …here’s to “either way” tomorrow. I don’t get this Djokovic before the final is better either – suppose they meet. Can Federer really beat Djoker on a hard court without going 4 or 5 sets? 2010 and 2011 were both 5 set semi finals and he lost them both. So if he does get through he might not be that fresh. Also a Sunday final this year. Ouch- i must have been blocking those 2010 & 2011 memories. Good point, Jonathan. Thanks for analysis Jonathan. As everyone has said, it’s all about the day. If he can up that 1st serve % I reckon, on these fast courts, he has a very good chance. The biggest thing (as he pointed out) is that Djokovic will be chasing that ‘Golden Masters’. I think actually that Lendl had 9/9 masters, but not the ones they play now, so this will be a record no one else has. He’s looked shaky through, and if either Goffin or Dolgopolov hadn’t choked, he wouldn’t be here. We have seen this before, of course, but Federer knows he can beat him (as in Dubai, notably the other very fast court), and Djokovic will be both tired and nervous, so I fancy his chances. Allez! How come the post was up so soon after the match? I was already in bed having a sweet dream of RF ‘Raspberry Fed’ lifting the hideous trophy 7th time. You must’ve been watching and writing simultaneously! Another great win against Andy, amazed by the stats, 2nd serve PT won% and puzzled by no BP faced despite he didn’t serve like a God, against one of the best returner on tour, wow. I’ve read Novak overcame injury and won yesterday. Is he injured or not? Who cares the guy is in the final tourney after tourney. Hope Fed has the edge today and my dream come true. Allez! Thanks for the post ! Not the best of matches, but happy to see Roger get it done in straights. Re Djokovic, read somewhere he had an MTO to check out his lower rib cage ?!? Last time I heard, he had an elbow injury. Guy is getting really creative with this stuff. Wonder which body part it will be if Fed gets off to a flying start in the final. Summed up poetically – nice one again Murli! Whether or not he wins, he *is* brilliant. Who else could still be playing this sort of scintillating, breath-taking, tennis as a 34 year old? Only the genius that is Federer. It will be fantastic if it was the Swiss that always stopped Djokovic from reaching a major milestone. Murray is a tricky opponent and glad Roger gets through it in flying colours. I hope he can stop Djoker on Sunday. He has some old score to settle. A laugh before the big final. Can you believe it! Wow! What a performance! Will Jonathan post today? Roger looked like he was running on rocket fuel. Every time he smelled blood, he almost jumped into the service box at Novak’s 2nd serve. On the other hand, Noval looked tired. His shots lacked the consistent depth he got us used to and Roger was just ruthless at every opportunity. Another master display of sheer aggressiveness, punctuated here and there with a few misses as in set 2, game 6. Pure delight.